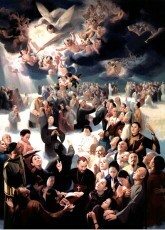 The Martyred Saints of China, or Augustine Zhao Rong and his 119 companions are saints of the Roman Catholic Church that John Paul II canonized in 2000. They consisted of 87 Chinese Catholics, and 33 Western Missionaries from the mid-17th century to 1930. They were martyred because of being missionaries, and in some cases, for their refusal to apostatize. Many died in the Boxer Rebellion, in which xenophobic peasants slaughtered 30,000 Chinese converts to Christianity along with missionaries and other foreigners. Although Christianity had spread itself around the world by this time, it did not reach China until the 600’s, by way of Syria. Depending on China’s relations with the outside world, Christianity over the centuries was free to grow or was forced to operated secretly. The 120 martyrs in this group all died between 1648 and 1930. Most of them born in China were children, parents, catechists or laborers, ranging from nine years old to age 72. This included four Chinese diocesan Priests. The 33 from the western world were mostly Priests or Women Religious, especially from the Order of Preachers, the Paris Foreign Mission Society, the Friars Minor, Jesuits, Salesians, and Franciscan Missionaries of Mary. Augustine Zhao Rong was a Chinese Soldier, who accompanied Bishop John Gabriel Taurin Dufresse, a Paris Foreign Mission Society member, to his martyrdom in Beijing. Augustine was baptized and not long after was ordained as a diocesan Priest. He was martyred in 1815. Beatified in groups at various times, all 120 of these martyrs were canonized in Rome, on October 1st, 2000. The Church celebrates them on this Feast Day, July 9th. St. Augustine Zhao Rong and his 119 companions were all martyred for trying to spread the Good News of Jesus Christ. They knew that it was a dangerous place to be doing this, and had to take their faith underground throughout the centuries. The Good News of Jesus Christ is intended to benefit all peoples; and the martyrs knew that. John Paul II reminded a crowd of Chinese and Western Scholars one year after these saints were canonized that history reminds us of the unfortunate times in the church’s past when catechizing was not always easy. May the Christians living today, live in such a way that Chinese women and men will be attracted to hear the Good News, and embrace it. We can all participate in this, and help spread the Gospel.